This is a cute quick read for upper grades. Nick Allen has always had a creative side and then he lands in Mrs. Granger's 5th grade class. 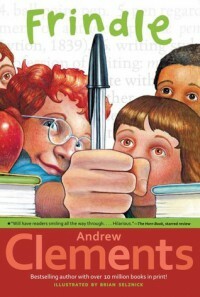 Mrs. Granger is all about vocabulary and it leaves Nick wondering, who makes a word, a word? So Nick decides to invent a word "Frindle" which Nick says is another word for pen. As the frindle trend grows among the school, so does Mrs.Granger's annoyance with Nick. I think this is a GREAT book for vocabulary building and a way to show how trends grow.